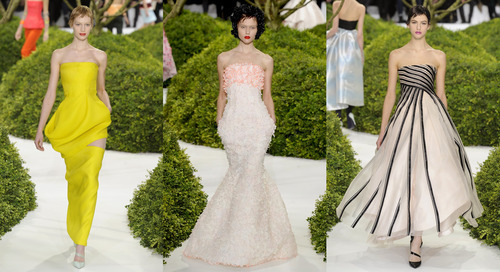 The elusive spirit of spring was captured at Christian Dior’s Haute Couture Spring 2013 collection, with a profusion of blooming flowers that signaled a new beginning. Extravagant floral motifs filled the Dior show with Raf Simons’ sculptural, yet hip new versions of Dior’s new look and came rendered in the softest sky blue, dove grey, along with romantic tones of blush, with pops of tangerine, vivid rouge, and citron green. Simons’ romantic asymmetrical draping coupled with cinched-waist skirts and lighter than air bouffant trapeze shapes looked modern and inviting. Simons’ ability to capture the true spirit of Dior’s understated elegance and feminine aesthetic was effortlessly merged with his romantic-modernist vision for the house of Dior. “A woman who dares to be different,” is how Raf Simons describes the modern Dior women.